I think I babbled on at Karen for way too long telling her how gorgeous her creations were. The stitching, the patching, the fabric... all perfectly combined with such energy, passion and a bucket full of humour to boot (just take a peek at her despicable Scottish seagull with it's bag of poo, ready to strike any unsuspecting passer by!) On the day I was having a very hard time deciding which Nameless Wonder was my absolute fave, but after much mooching around their Facebook page George the Spaniel is coming a close second to Karen's charming foxes! "I’m inspired by old toys – especially my own (why grow up?) – and the wonderful animals, particularly cats, that I’ve found in Japan, made from scraps of kimono fabric; also by the amazing work of Louise Bourgeois. I’m completely led by the physicality of materials and can’t resist the urge to try out new combinations of materials and making techniques to see what will happen. Every piece of work throws up a host of new questions and ideas, so my mind is always on a dozen projects at once." 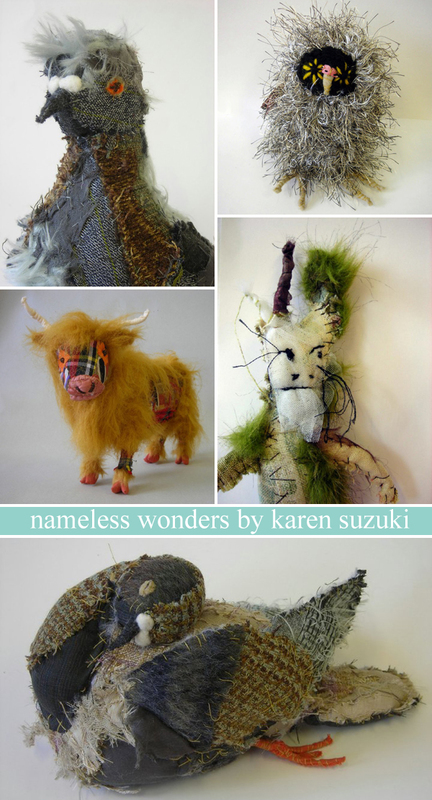 For more info about Karen and her fabulous animals with attitude (who hail from Glasgow, Scotland) please do take a peek around some of her sites: Website, Etsy, Folksy, DaWanda, Facebook. I especially love the foxes too. Wow! Wonder is an understatement for each of these unique critters. What a lovely imagination, investigation, observation, and skill hath Ms Suzuki. If I had come upon this collection and the opportunity to chat with Ms Suzuki, I know I would also have wanted to stay a long, long while, Emma. And would have been hard pressed to pick a favorite. Oh my goodness...I LOVE them! The combination of stitches, fabrics, wit, and a little bit of naughtiness, is perfection. Thanks so much for this post! I am completely smitten and am looking forward to checking out her sites for the perfect gift. Have a fantastic weekend, Miss Emma!